In large skillet, combine water, vinegar, broth mix, peppercorns, and bay leaf. Bring to a boil; reduce heat, place salmon in skillet, and simmer 5 minutes, or until fish flakes easily with a fork. Lift fish from pan to a rack placed over a plate. Cook. In a small saucepan, sprinkle gelatin in 1/2 cup clam juice to soften. Stir over very low heat until gelatin dissolves. Stir in remaining clam juice. Chill until syrupy. 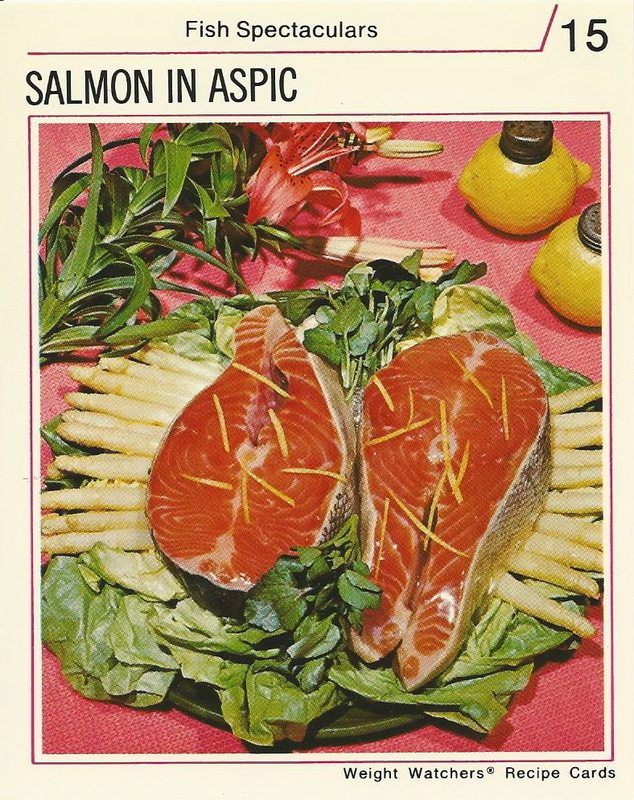 Spoon a layer of gelatin mixture over salmon. Chill until glaze is set. Repeat 2 or 3 times until salmon is well coated. Line plate with lettuce leaves. Arrange asparagus on lettuce. With spatula, transfer salmon to center of plate. Garnish with lemon peel and watercress. Divide asparagus evenly. Makes 2 dinner servings, 1 steak each.